Live Laugh Decorate: Tall Ceilings? What Do I Do? Tall Ceilings? What Do I Do? One of the biggest design dilemmas I hear from clients is how to deal with insanely tall ceilings. Since many newer homes in South Florida come with this added feature, I hear this complaint often. Some clients feel a tad intimidated, some are even downright petrified. Guess what? Those ceilings don't bite. In fact, there are many people in the world who would kill to have them, so here are some tricks I've used to remove the fear of those dreaded ceilings. Embrace them. They really ain't going nowhere, unless of course you plan to sell your home, and that may not be such a good idea at the moment. Once you've accepted that, set a budget in mind to decide how much you can afford to spend to bring some major wow to the windows. 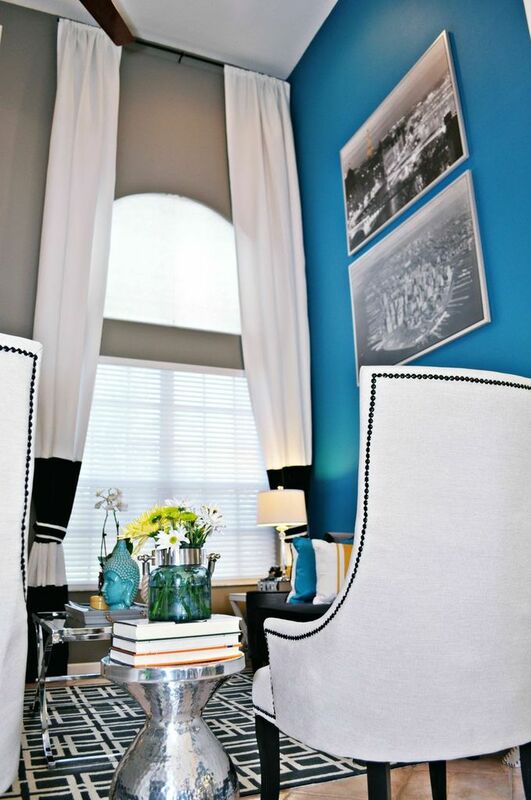 If you can splurge, then fully customized curtains are the way to go. In the panels below, we used a silk dupioni, fully lined with a Greek Key trim along the edges. Notice that the drapes frame the arched windows when open therefore still letting in maximum light, and will completely cover them and the regular window when closed for complete privacy. If you're not worried much about privacy, then you can save a lot on those custom drapes by making them just decorative panels vs ones that can open and close all the way. The latter option requires a lot more fabric. You can also customize store bought panels. I love these Ikea panels because they are 118" in length. This means you can buy panels in two different colors, add one at the bottom to create a banded panel for a look that is custom but inexpensively so. I'd also add rings to these panels for an even more custom look. Another trick? Grouped art. 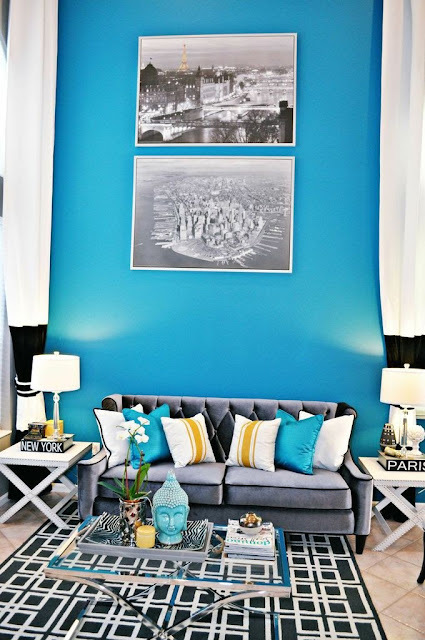 Use those tall walls to show off over-sized pieces of art or family portraits as shown here. 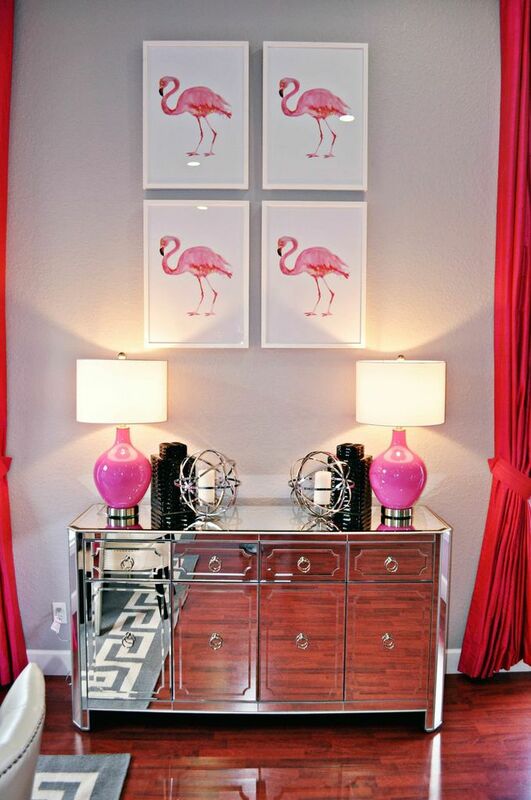 The Flamingo piece by itself was relatively small, but as a grouping of four, it added a dramatic element to the wall and draws your eye upward. The black and white pieces used here are from Ikea and they are massive. They have quite a collection that size and are just $50, which is a steal for framed art. There you have it. I hope this helps to calm some of your fear of those dreaded ceilings. What have you done to embrace those ceilings? I'd love to hear some your own secrets. Holla. Fabulous options! I have tall ceilings in my home. Great tips ladies! I have tall ceilings and I absolutely love them! I skipped drapes on my windows and I think they still look great, luckily though the sun doesn't go straight to them. Great post. I haven't run into ceilings that tall yet! I love long lean drapery panels though and color and texture go a long way in occupying the eye! Wao, this is a great post!! In love with those flamingos! My daughter would really like one I think. I agree the height just adds drama and the fact that more light comes in can only help the entire space. I love how you say that they don't bite! ha! Love the curtain panels and art to decorate. I appreciate this post a ton! One thing I am dealing with in our new home is that the master bedroom has tall, slanted ceilings. It is so weirtd to decorate and find balance. Any tips! I'd love to see a post from you or any tips about this subject too! Great post! Ikea to the rescue again!! Great post! Very enlightening with some invaluable tips for sure! I usually hate store bought panels because they are too short, but the length on those Ikea ones you mention is great. I'd rather deal with "too long" than "too short." Can I just say that I wish tall ceilings were a problem I had to deal with. I have tall ceiling envy. Your solution is really perfect. I can't imagine how much fully custom would cost for that blue room. We are currently learning to deal with our 8 foot ceilings... Quite a reversal from our crazy tall ceilings in Dallas!